Today we received a tall, medium sized box in the mail. What in the dickens is it? Why a Christmas tree in the mail of course! Josh's parents, Don and Nada, figured out a way to send holiday spirit in the mail. 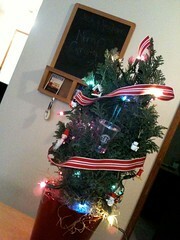 I was super excited when we opened the box to find a cute, little tree to brighten up our place. And the bonus...lights and ornaments were included! Now our place has more holiday spirit (and smells good too). Thanks Don & Nada!